How do I customize a Quill Lesson? Coming Soon: We will be launching our own editions of lessons in the next two months. Some of Quill's editions will cover lessons about science and history topics. Switch prompts to material that you are discussing in class, such as books you are reading in class, or material that is more relatable for the students. Change the prompts to ones that better suit their skill level. Change all the texts and prompts to new copy and teach a whole new lesson. 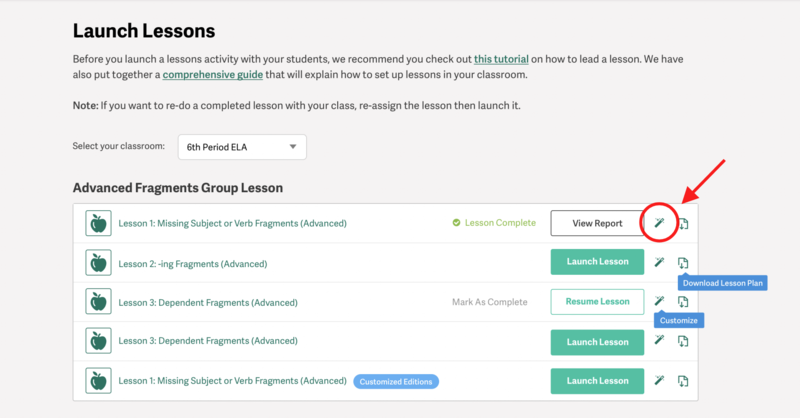 1- On Launch Lessons page, you can see the lessons that you have assigned. 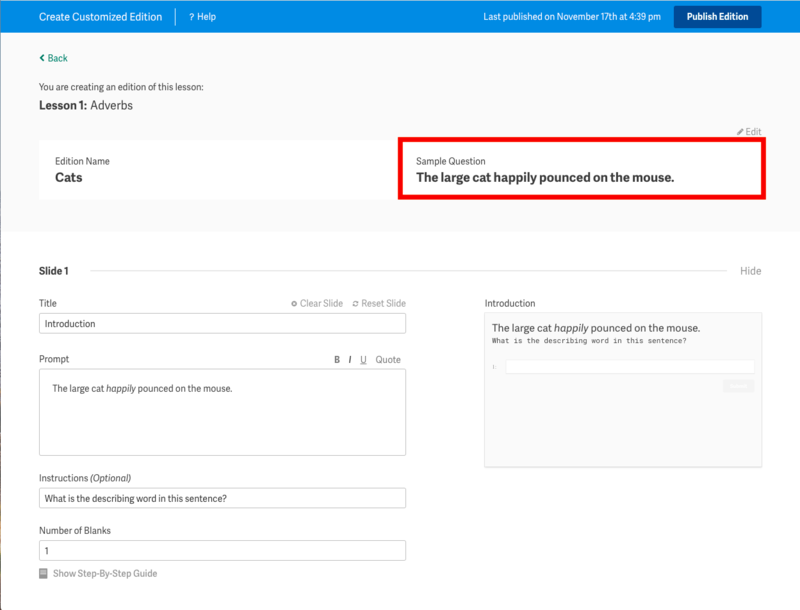 Click on the customize icon on the lesson that you would like to customize or create an edition of. 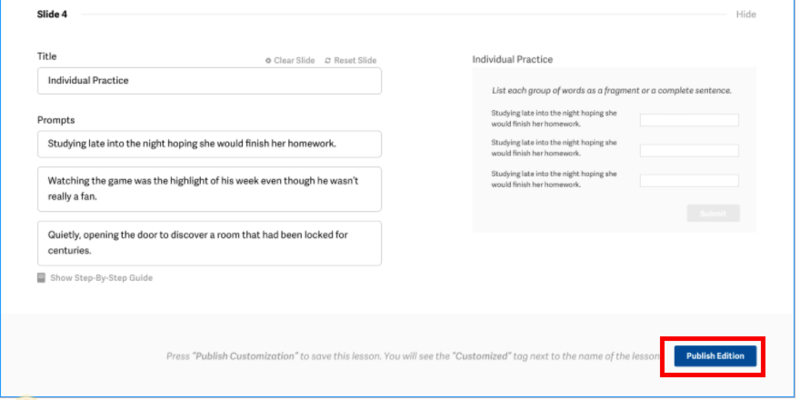 2- On the next page, click on the Customize drop down and select Make Copy to clone that edition of the lesson. This clone is your new edition, and will be editable. How do I customize the slides? 1- After creating a copy, you will be prompted to enter a name for your edition. Note: We recommend entering a sample question for each edition. Sample questions will help you identify editions before you launch them. 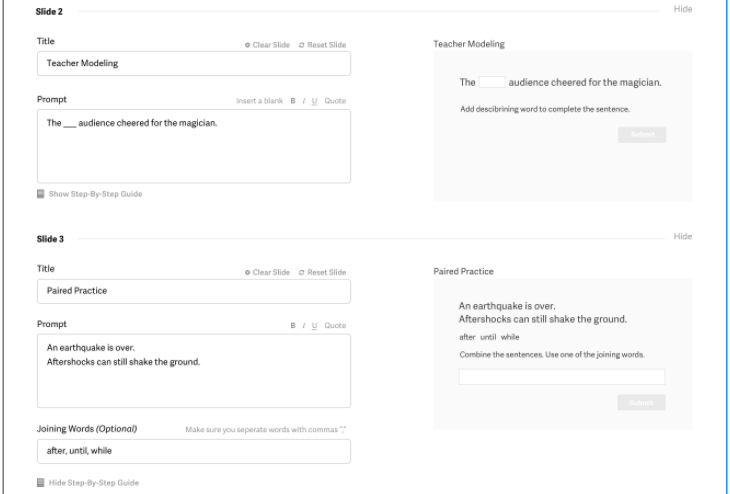 2- On the customization page, you will have a list of all the slides in the lesson. Each slide section includes a preview of the slide next to a form where you can change the prompts. 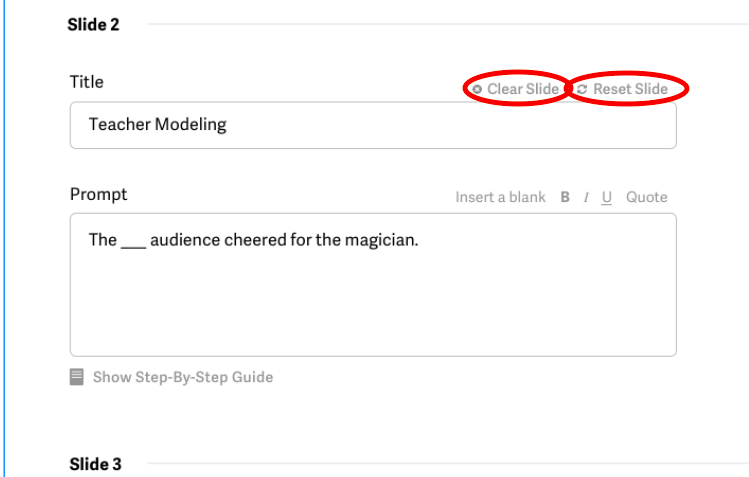 3- If you would like to change the prompt and the title of the slide, you can click on "Clear Slide" to remove all of the text. You can restore the original copy of the slide by clicking on "Reset Slide"
4- When you are done customizing your edition, click on "Publish Edition" at the bottom right hand corner of the page. 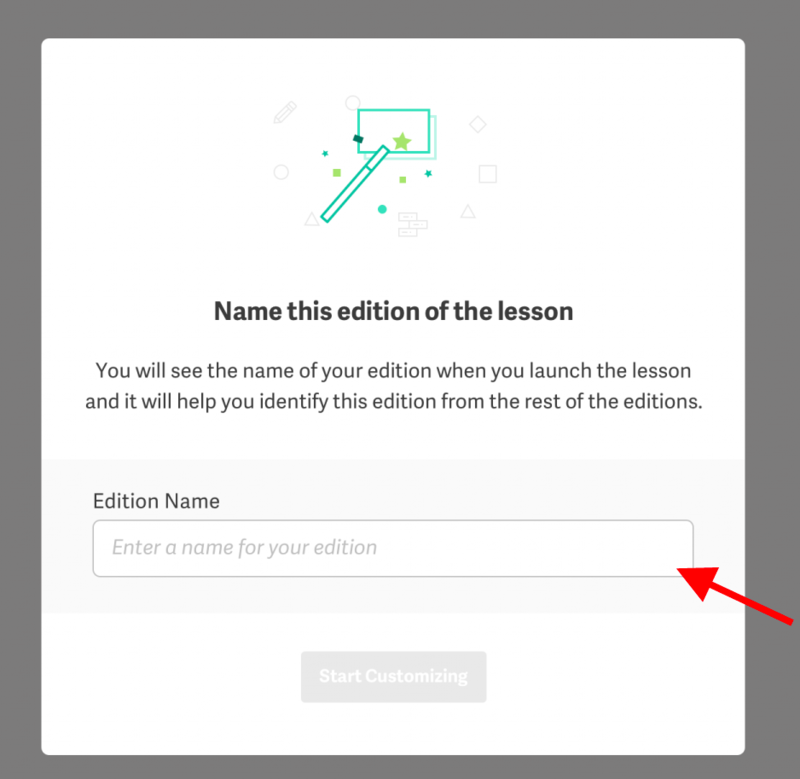 Once the edition is published, the lesson will get a "Customized" tag on the Launch Lessons page and you can launch or preview the edition that you have created. How can I edit an edition of a lesson? 1- Go to your Launch Lessons page. 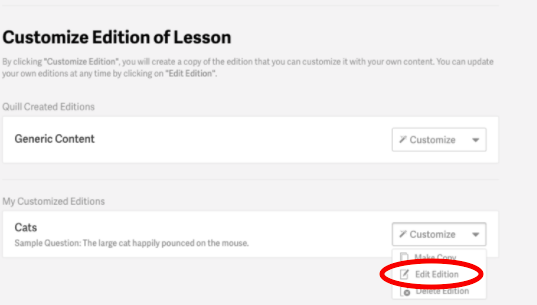 Under My Customized Editions, there is a drop down menu that give you the option to make a copy, to edit an edition, or to delete the edition that yiy you created. 2. Clicking this will bring you back to the list of slides to customize. How can switch editions in a launched lesson? 1- During your launched lesson, you click on the customize icon (magic wand) in the nav bar of the lesson. 2- Click on "Switch Edition" and you will be able to change the edition of the lesson that you have launched. Note: As of yet, you cannot change the number of slides. However, this feature will be available soon.